The Bedford NH real estate area has that distinctive “old town charm” but offers the convenience of proximity to the larger New Hampshire cities and towns including Manchester NH. You’ll find a wide variety of Bedford NH home styles including condominium and townhouse complexes, to older traditional farmhouses plus newly constructed homes. See Bedford NH New Construction for more information about building new homes. Bedford NH’s quaint “Bedroom Community” feel offers something for virtually every home buyer. While nearly 80% of the Bedford is comprised or residential homes, the town also contains a commercial center that employs many professionals in the high tech arena. Bedford is merely an hour from Boston and tends to appeal to a more affluent market. Bedford New Hampshire homes can tend to be on the pricey side-four or five bedroom colonial style houses may cost upwards of $500,000. Despite the somewhat expensive home prices in Bedford, New Hampshire’s low tax rate is another draw that pulls individuals from other neighboring New England states. Bedford NH real estate appeals to both young families and single professionals, to older adults looking for retirement communities in which to settle. 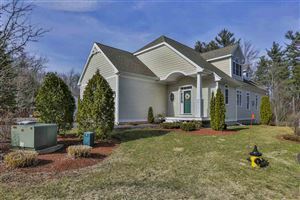 See all Bedford NH Real Estate.